Overlooking the harbour sea, and facing west offering spectacular sunsets, Sea Dream House, is easy walking distance from the quaint center of the island; Dunmore Town. Girls Beach, is a two minute walk out your door to a fabulous shallow beach site of the famous picture tree and the home of wonderful bonefishing and shelling. The wrap around veranda makes easy living outdoors enjoying the local views or swinging in a hammock with your favourite novel. The 3 mile long Pink Sand Beach which has made Harbour Island one of the most treasured islands in the Caribbean is a 5 minute walk or a short golf cart ride in the other direction on the east side of the island. 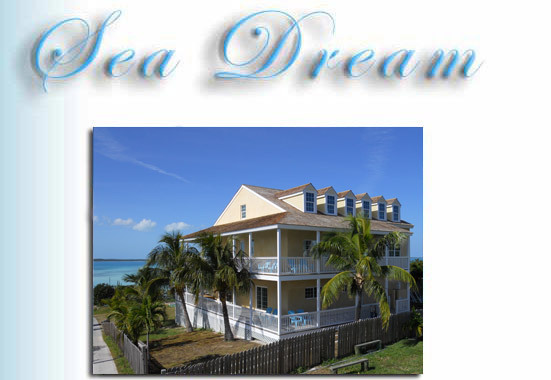 Whether youre starting your lives together on a honeymoon or are having a long overdue family re-union Sea Dream House offers privacy and simplicity in a Bahamian setting. With over 4,000 square feet of living space the house can accommodate up to 10 people with 5 bedrooms (2 kings, 2 queens, 2 twins) and three bathrooms. A crib, high chair, saucer and 2 car seats are provided. A full-size soaker tub and two jacuzzis allow you to unwind after a run on the beach or an invigorating game of tennis. Modern conveniences such as DVD and CD players, dish washer, a 6 burner double oven Thermador stove, 4 TVs, video machines, books, DVD and video library and full air conditioning make it the ideal get away from your hectic lives without sacrificing to primitive uncomfortable surroundings. A full gourmet kitchen invites you to stay in and try your hand at local lobster or snapper fish or have one of the cooks from the island come by and make up some peas and rice or conch chowder.